Scotland head coach Vern Cotter says his team are "lining up for the arm wrestle" and are showing more "explosiveness" ahead of the World Cup. The Scots lost their final warm-up Test 19-16 to France and Cotter believes the run-out in Paris will help his side in their World Cup opener against Japan. "It certainly went up a level and was a very physical game against a very aggressive defence," he said. "It was a big game with some pleasing things but things we need to work on." Scotland went in 9-6 at the interval at the Stade de France thanks to the boot of Greig Laidlaw but lost momentum on occasions with problems at the set piece and losing line-out ball. 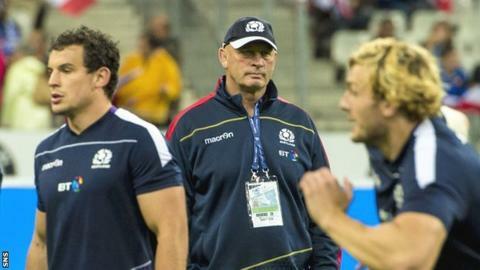 "We didn't get ball and when we did it wasn't clean," said Cotter who was in charge of Scotland for the 16th time. "Despite that, I thought the players defended really well. The guys put in some big hits. Sometimes in days like that if you don't have the ball then you make up for it in other ways. That means you're adapting." Cotter had special praise for John Hardie in the week the New Zealander picked his fellow countryman for Scotland's World Cup squad despite only having played an hour of rugby for the national side. He said: "Crikey, John added an edge. He was very effective and got through an enormous amount of work. "This sort of thing inspires people. He's a class player. We've got some class players and there are some class players that didn't make it." Scotland's attention now turns to the World Cup and the opening match against Japan on 23 September, followed by games against the United States, South Africa and Samoa. And, while acknowledging more work needs to be done, Cotter says there is a determination ahead of travelling to England for the finals. "We're getting better," he said. "We got a reminder that we need to work on our line-out. I thought our scrum was better. "I think we're showing agility on the field - both mental and physical. We're lining up for the arm wrestle, which is good. "We're showing a little bit more explosiveness around the contact areas but we need to develop a bit more confidence. We want to do really well in this World Cup and the players are determined."